It's called the "Mega Tamago" and has (as you can see) 3 beef patties, 2 strips of bacon, an egg, cheddar cheese, lettuce, a 'special' sauce and 3 buns. 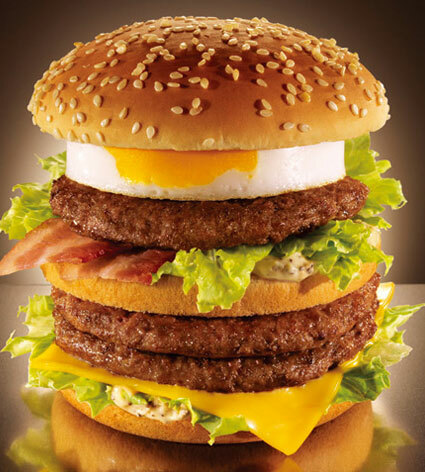 It is described on McD's Japan website as: "The Mega-Egg. Quivering with mega deliciousness." That? Looks ridiculously awesome. Love burgers with eggs and bacon on them! If you want a really good burger with egg - check out Red Robin's Royal Red Robin Burger. SOOO tasty - I order it every time. Five Guys needs to start egg as one of the condiments too. It must be sold every summer because it was available when I lived in Tokyo last summer (I have pics on my blog). I never bought one because why eat at McD's when you can get a delicious Black Pepper Whopper right down the street?? Jessica: Why eat at BK when you can get a delicious Big Mac, Quarter Pounder,Cheeseburger, Double Cheeseburger, Double Quarter Pounder, Big'N'Tasty, ANY BURGER OTHER THAN A BK BURGER right down the street? The Red Robin burger sounds awesome. Always wanted a egg on my burger. Everything I hear says egg on a burger is awesome. McDs' needs to try this burger out here in the states. Effing fat Americans, you have your own fast food outlets to pig out on. Go praise to your golden arches and the colonel. Isn't it odd that a burger that has a notable resemblance to a mushroom cloud is only sold in Japan? Odd placement of the cheese. Ever since I first saw the Mega Tamago I've wanted to try one, but I live in Milwaukee and they only sell it in Japan, so I figured the next best thing to do was create my own Mega Tamago Burger. I also made mine a double!